New Jersey travel: Great Places in South Jersey! South Jersey has wonderful beaches and the Atlantic City Casinos, but it has a lot more. This travel and tourism site about Southern New Jersey has links to and information on many great things to see and do in our area, from the Delaware River and Delaware Bay to Cape May and the Jersey Shore in Gloucester, Camden, Atlantic, Cape May, Cumberland & Salem Counties in New Jersey. These are some of Southern New Jersey’s Greatest Places – Great Places in South Jersey for you and your family to enjoy—Welcome! South Jersey is more than great beaches and casinos--how many of these Great Places have you enjoyed? Cowtown Rodeo: This real Saturday night rodeo, located in a quiet corner of New Jersey that looks more like the Great Plains than the most densely populated state in the U.S., has been running since 1955. Bucking broncos, bull riding, ladies' barrel racing, and more. Nice family atmosphere. Sunset Beach: just west of Cape May, prospect right on the beach for fabulous Cape May Diamonds, see the remains of the concrete ship Atlantus, and take part in the moving Evening Flag Ceremony (you will definitely want your kids and grandkids to see and participate in this wonderful Cape May institution). NJ Motorsports Park: opened in July, 2008: located on land that was part of the Millville Airport, this contains several tracks for road cars and go-karts. Not on the Great Places Video. Leamings Run Gardens: 22 separate gardens, each with its own theme, plus a log cabin and farm animals. Here, there are "You May Walk on the Grass" signs! A wonderful, relaxed place, even the kids will enjoy! Millville and the Arts Center: or, link here: it's not in the Great Places video, but it's pretty neat--we now have several art galleries, a couple of good restaurants, and everything's open late on the 3rd Friday of the month. Cape May-Lewes Ferry: you can take a 70-minute salt water "almost ocean" cruise and leave your cares behind (if you want to be a foot passenger, you can leave your cars behind, too). It's more than just a mode of transportation. It's a pleasant part of the trip. If taking your car, reserve early! Lucy the Elephant: a 65-foot high wood and metal behemoth calmly surveys the Atlantic Ocean in Margate near Atlantic City! Millville Airport: site of Millville Army Airport Museum, is revisited periodically by World War II airplanes and the pilots who flew them. East Point Lighthouse: a small treasure on South Jersey's "Other Coast". Hereford Inlet Lighthouse: working lighthouse, museum and gift shop in North Wildwood. Adventure Aquarium: fish, seals, marine exhibits, just across the river from Philadelphia. Marine Mammal Stranding Museum: rescued seals are nursed back to health and released; lots of big, soulful eyes here! Cape May Lighthouse: 199 steps to the top, and what do you see? Cape May Point State Park: great place for a nature walk, at the base of the Cape May Lighthouse. You take a trail through the woods and reeds, then end up on the beach, where there's a concrete gun emplacement from WW II that's (literally) standing taller every year. A very unique and wonderful place. Cape May County Park & Zoo: this Zoo is the greatest! It's been recently expanded to over 80 acres; the animals have lots of room to roam, and so will you! Cape May Seashore Lines: historic Budd diesel cars ply the rails between the Cape May Zoo and now, Cape May. Ocean City: is called America's Family Resort; it has a very nice, family-friendly atmosphere. A good antidote to what we see in the news day after day. Salem County Historical Society Museum and Historic Salem's Market Street: local people in colonial dress, romantic gardens, Salem's Historic Oak, and the Hancock House Revolutionary War massacre site. 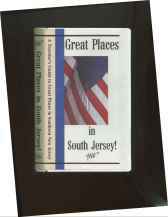 Buy the "Great Places in South Jersey" Video and see all of the above places (except as noted) from the comfort of your home! With the Great Places travel video, preview these Great Places before you get here! © 2013 Clay Mikolasy, Producer of "Great Places in South Jersey"